Here’s a scrummy afternoon treat for those with half-hour to spare. I tried my hand at this family recipe, which is apparently not quite like you’d expect to see it elsewhere. Rub the flour, butter and sugar together until you have a uniform consistency. Add the sultanas and work in across the mixture. Add milk, a drop at a time until you have a soft dough. Divide the dough into 6-8 parts and work each into a round thickish pat. Place the pats onto a flat baking tray. Glaze each with a little milk. Cook in an oven at 180⁰ or so for 12 to 15 mins. When you get them out, leave to cool a bit, but part of the enjoyment here is to eat them whilst warm with real old-fashioned butter and cream and/or jam (and worry about where the defibrillator is later)! 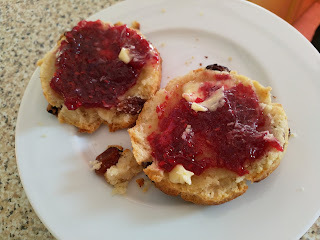 This particular recipe and method aims to ensure that the scones are soft and light on the inside with a crispy shell. Yum!